Grammys 2018 Bruno Mars Kendrick Lamar Takeaways The 2018 Grammy Awards did what the Grammys so often do: They dashed high expectations with safe picks and, in many cases, flat performances. But a few highlights stood out. Bruno Mars swept the major categories at the 2018 Grammy Awards. The trajectory of the night said it all. The 60th Grammy Awards opened Sunday with the promise of an explosive performance by apparent frontrunner Kendrick Lamar, punctuated by superstar cameos (U2, Dave Chappelle) and a heady cocktail of grit and visual imagination. The show closed with the completion of the least exciting possible sweep, as Bruno Mars — a gamely appealing pop star whose funky but lightweight jams peppered radio playlists all year — won Album Of The Year (for 24K Magic), Record Of The Year (for "24K Magic") and Song Of The Year (for "That's What I Like"). Grammys gonna Grammy. That's Takeaway #1. #2: On a night of mostly muted performances — and, especially in the show's first half, mostly muted activism — Kesha stood out. The singer's 2017 career resurgence culminated in a raw and powerful performance of her hit ballad "Praying," in which Kesha was flanked by the likes of Cyndi Lauper, Camila Cabello and Andra Day, not to mention backed by the Resistance Revival Chorus. Inspired by Kesha's high-profile personal and legal battles over her allegations of sexual abuse, "Praying" provided the sort of powerhouse #MeToo anthem the evening otherwise lacked. #3: Kesha provided a major highlight of the evening, but where the actual awards were concerned, it was an abysmal night for women. In the days leading up to Sunday night's telecast, a study published by the University of Southern California's Annenberg Inclusion Initiative showed that in the past six years, more than 90 percent of Grammy nominees have been men — a statistic that's come up a lot as the industry begins to grapple with sexual misconduct. Which didn't make it a great night to see women win just one out of the Grammy telecast's 10 awards (two if you count Rihanna's featured spot in Kendrick Lamar's "LOYALTY."). #4: It was a night of sweeps and shutouts. 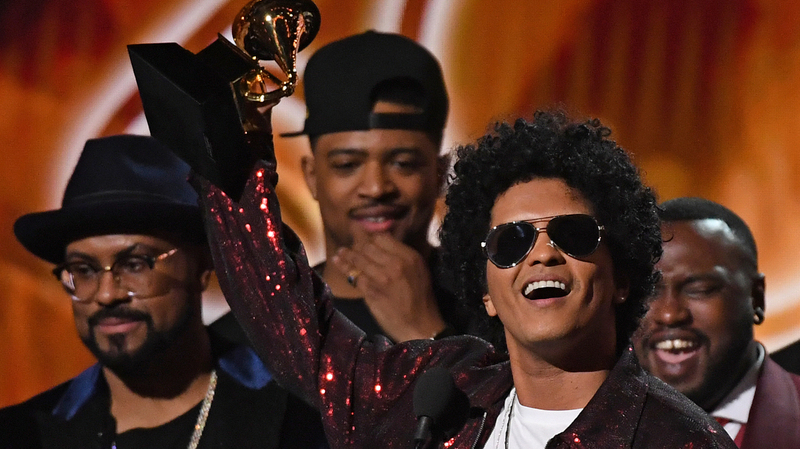 Chris Stapleton went 3-for-3, and Bruno Mars won all six Grammys for which he was nominated — seven if you count a win for engineering on 24K Magic. Meanwhile, Jay Z went 0-for-8, SZA went 0-for-5, Luis Fonsi and Daddy Yankee's "Despacito" went 0-for-3, and so on. The awards didn't get spread out a whole lot, though Childish Gambino did manage to go 1-for-5 thanks to a win for Best Traditional R&B Performance. #5: SZA's five losses will sting for a while. With no offense intended to Alessia Cara — an engaging pop singer whose songs have brightened the airwaves for a few years now — her Best New Artist win over SZA was a travesty. SZA's Ctrl offered up a fascinating, alluring re-envisioning of R&B, and it was packed with jams; this pick felt like the sort of Best New Artist misfire for which the Grammys used to be notorious. #7: Okay, so someone at the Grammys really likes Sting. No, he wasn't nominated for any awards. But Sting just kept popping up — once as a presenter, once in an interminable skit with Shaggy and host James Corden, and once in a performance of his Top 20 hit from 1987, "Englishman In New York." The song's immigration narrative provided a hint as to why the song might be a relevant part of a Grammys telecast in 2018; that and the fact that the Grammys had newly relocated to New York's Madison Square Garden. Still, while Sting has won 16 Grammys in his career, he hasn't been so much as nominated since 2006. #8: Who needs a host? Look, hosting awards shows is hard — it's a tough, thankless job, and almost no one writes about how awesome you were the next day. But James Corden added little to the night's proceedings, from the aforementioned skit with Sting to a bit where he talked to his parents in the audience. The Grammys used to have genial rapper-actor LL Cool J serve as a nominal host, and he gave the gig a bare-bones approach that kept the telecast moving along. Let's maybe consider going back to that? #9: Country got to mourn, and not much else. Country music usually has a strong presence at the Grammys, but with the genre shut out of the general categories, it was mostly relegated to expressions of grief and loss. Aside from a straightforward performance of "Better Man" by Little Big Town — and a lengthy Target commercial showcasing Maren Morris' poppy side — country stars only got to perform Eric Clapton's "Tears In Heaven" (Morris, Eric Church and the Brothers Osborne) and Tom Petty's "Wildflowers" (Chris Stapleton and Emmylou Harris), the latter of which kicked off the In Memoriam segment. #10: Blue Ivy will save us all. Sitting between Jay Z and Beyonce, dressed all in white, 6-year-old Blue Ivy Carter immortalized herself in GIFs all night, most notably in an adorable attempt to suppress her mother's clapping. Jay-Z and Beyonce are no strangers to high-profile Grammy disappointment — the former was, as noted, shut out Sunday night — but the two stars took home the best prize of all.